A few years ago in Greece, I noticed flags flying at half-staff, and wondered who had died. Then I remembered it was Good Friday — marking the day of Jesus' crucifixion. I was initially disoriented because I had actually celebrated Easter before arriving in Greece. The date for Western Easter depends in part on phases of the moon, but Eastern Orthodox churches base their date on the older Julian calendar — and consequently often celebrate after the West. No matter when they celebrate, Christians traditionally prepare for Easter by fasting from meat — then feasting. Greece celebrates with particular gusto — and lots of lamb. I was lucky enough to be there for the celebrations. During Holy Week, children customarily drop by their godparents' home for a little quality time — which may include dying eggs deep red, to symbolize the Christ's blood. Godparents give their godchild a big chocolate egg and a special candle to hold at the Resurrection ceremony on Easter Sunday. From Thursday to Sunday, one church service seems to blend into the other. Churches remain open nearly 24/7, and worshippers stream in and out. In the Eastern Orthodox faith, standing empowers prayers — men on one side of the aisle, women on the other. As the service unfolds, there's lots of spectacle. The priest wears a long black robe and a tall hat. He typically has a long beard — a sign of wisdom, experience, and gravitas. For Easter services, the church is specially decorated, draped in lots of mourning purple. The marathon Orthodox service is basically a symbolic funeral for Jesus. Just as the disciples readied Jesus for burial, the faithful prepare his tomb. 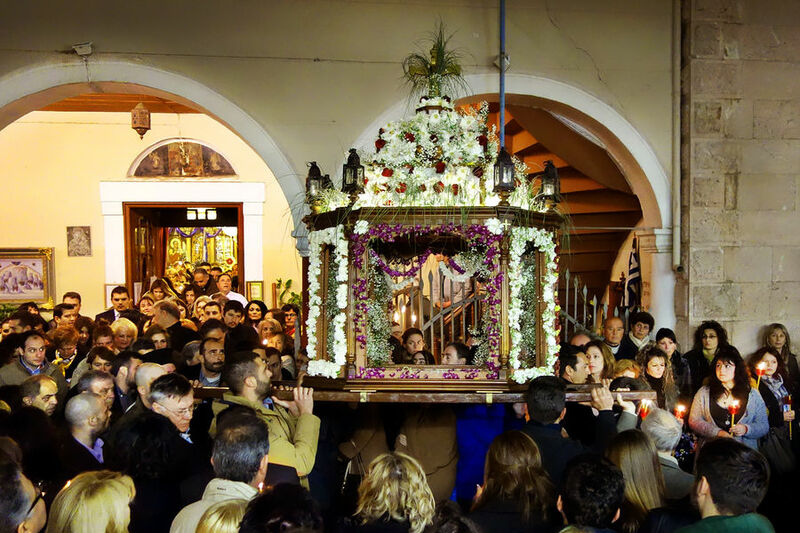 It begins on the morning of Good Friday, when women flock to their parish church to decorate the symbolic tomb, or coffin. It can be as simple as a plywood box or an elaborate canopy. They decorate the exterior with flowers, and lovingly sprinkle flower petals inside as a resting place. The ritual of mourning continues throughout the day. As dusk arrives, the funeral procession starts. The coffin is lifted onto broad shoulders and carried out of the church. All over town, other churches simultaneous perform the same funeral rituals — carrying their individual coffins through town. The parades converge on the main square, where it seems the entire population awaits. The bishop, flanked by the town's priests, gives an Easter message — reminding his flock why Jesus died and why there's reason for hope. For the most fervent faithful, the service continues all night long. On Saturday, worshippers pack their church yet again. Saturday is the longest Orthodox service of the entire year. This is to remember how, while his disciples were mourning on earth, convinced that Jesus was gone for good, Jesus was continuing his mission — having descended and doing battle with the devil. The priest changes out of his mournful black vestments and into hopeful white ones. Much happier and more animated, he tosses dried flower petals over his parishioners. This lets them know that Christ has accomplished his task — the chains of hell and death have been broken, and new life is on the way. The people spill from their churches and once again fill the main square in town. This time, the mood is lighter — there's a palpable sense of expectation. Easter Sunday is on its way. When midnight strikes, fireworks light up the sky and, finally, Easter is here. 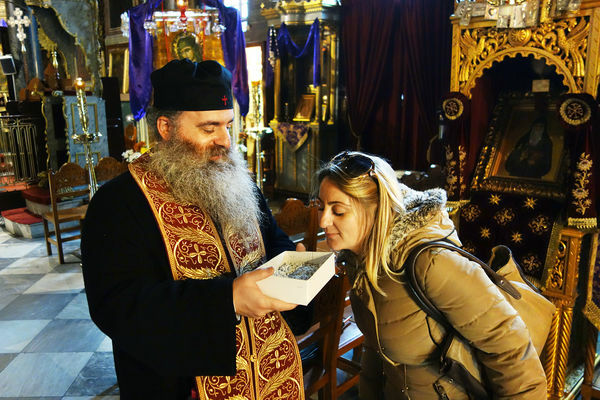 The Holy Flame, which literally travels from Jerusalem to Athens, and then to towns throughout Greece, is shared along with the ritual Easter "kiss of love." And it's not over yet. Everyone then heads home for the biggest party of the season. People carry the Easter flame home as a burning candle. Raising it above their heads, they make a cross above the doorway symbolizing that the light of the Resurrection has blessed their home for another year. Easter is a time for family — and for roasting a lamb or goat on a spit. On Saturday, the traditional meal is magiritsa — a soup made of the lamb's liver, along with lots of greens and lamb guts — to prepare everyone's stomach for next day's feast after a meatless Lent. On Sunday, a long table awaits as the extended family gathers. Each person chooses a blood-red egg and taps it against someone else's egg. The eggs symbolize Christ's tomb, and the cracking symbolizes his Resurrection. The last person holding an uncracked egg will enjoy good luck in the following year. The feast continues into the wee hours of Easter Sunday with lots of meat and eggs, and no shortage of Easter bread. Everyday Greece offers sunshine, seafood, whitewashed houses with bright-blue shutters, and a relaxed, Zorba-the-Greek lifestyle. 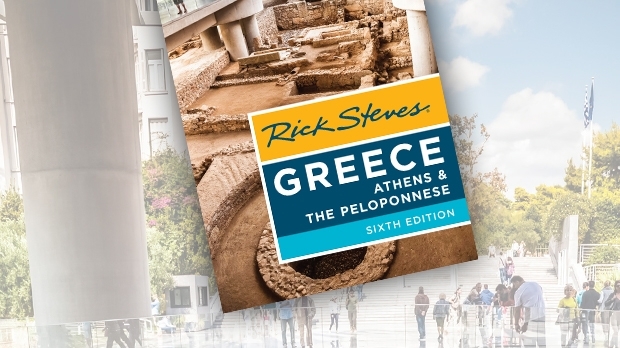 But for a special glimpse at the culture, celebrate Easter with the Greeks. You'll find a time filled with tradition — and with promise.